When their mother needs to leave in order to find their estranged father, seven year-old Jin and her younger sister, Bin, are left to live with their Big Aunt for the summer. With only a small piggy bank and their mother's promise to return when it is full, the two young girls are forced to acclimate to changes in their family life. Counting the days, and the coins, the two bright-eyed young girls eagerly anticipate their mother's homecoming. But when the bank fills up, and with their mother still not back, Big Aunt decides that she can no longer tend to the children. Taken to live on their grandparents' farm, it is here that Jin comes to learn the importance of family bonds in this beautiful, meditative, and thought-provoking second feature from So Yong Kim, the acclaimed director of IN BETWEEN DAYS. Variety's Robert Koehler said of Kim's film: "drawing out beautifully natural performances from her child actors, Kim once again has a distinct way of letting her camera observe her characters with kind thoughtfulness, allowing for a quiet mood to wash over the scenes." 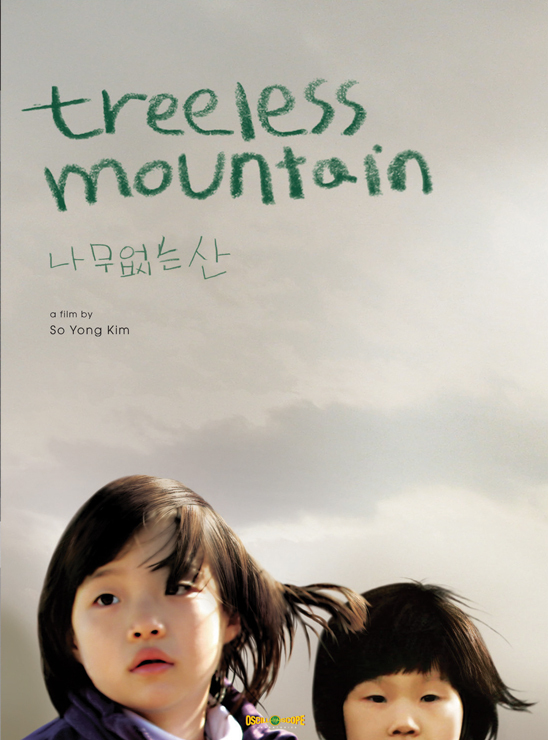 TREELESS MOUNTAIN is So Yong Kim's second feature film. The script received support from the Cannes L'Atelier Program, the Sundance Institute's Writers and Directors Labs, and the Pusan Promotional Program. Kim's first feature, IN BETWEEN DAYS, was acclaimed by critics and won the Special Jury Prize at the 2007 Sundance Film Festival along with the International Critics' Prize at Berlin. It was also awarded an LA Critics Prize and Best Film and Best Actress Prizes at Buenos Aires. Kino International and the Sundance Channel released the film in North America, and With Cinema released the film in Korea. So Yong Kim was born in Pusan, South Korea and immigrated to the US when she was twelve. She studied painting, performance, and video art at the School of the Art Institute of Chicago where she earned her MFA. She has made several experimental short films including A BUNNY RABBIT, shot by renowned cinematographer Christopher Doyle. Kim also produced Bradley Rust Gray's award-winning Icelandic feature, SALT, in 2003. In 2006, Kim was featured as one of the "25 Filmmakers to Watch" in Filmmaker Magazine. Audio commentary with director So Yong Kim and Producer Bradley Rust Gray. Post Screening Q&A with So Yong Kim at New York's Film Forum. Interview with child actors Kim Hee Yeon and Kim Song Hee at the 16th Annual Altin Koza Film Festival in Adana, Turkey.